Sometimes on Date Night we must revert to “Plan B” when our original ideas do not work out. Tonight, we have to revert to “Plan C” because the first two places that we want to visit are too busy and we can’t get in. We read all of the economic news, but evidently certain restaurants are immune to what is supposedly a slow economy. 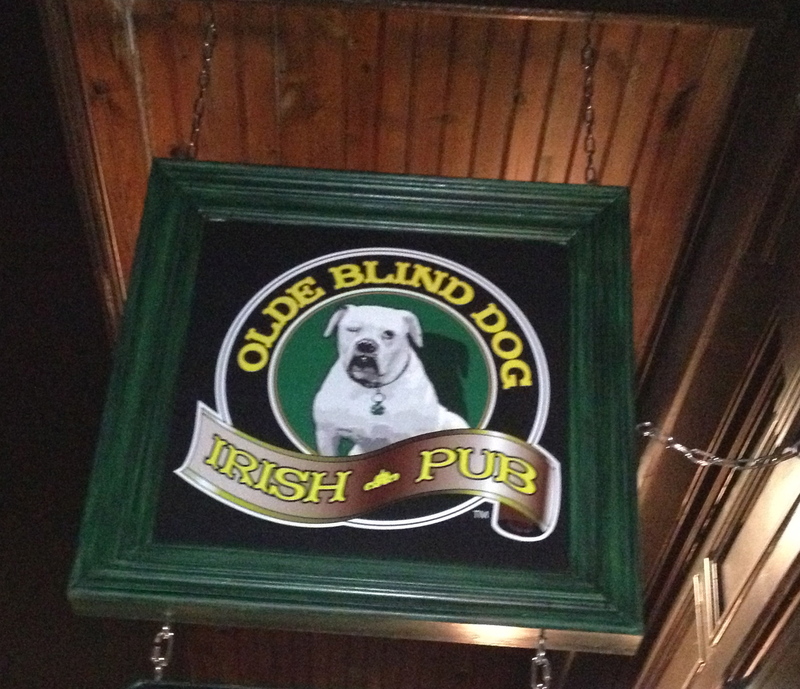 We are in North Alpharetta (or South Milton, depending on how you look at things) at the Olde Blind Dog. Everyone loves a good Irish bar. We have eaten here many times for post-bike ride lunches with our cycling friends and have always found the food to be good, but the kitchen to be very slow. The place is crowded and noisy when we arrive, but we are seated immediately. We cross our fingers that the kitchen will be able to keep up. 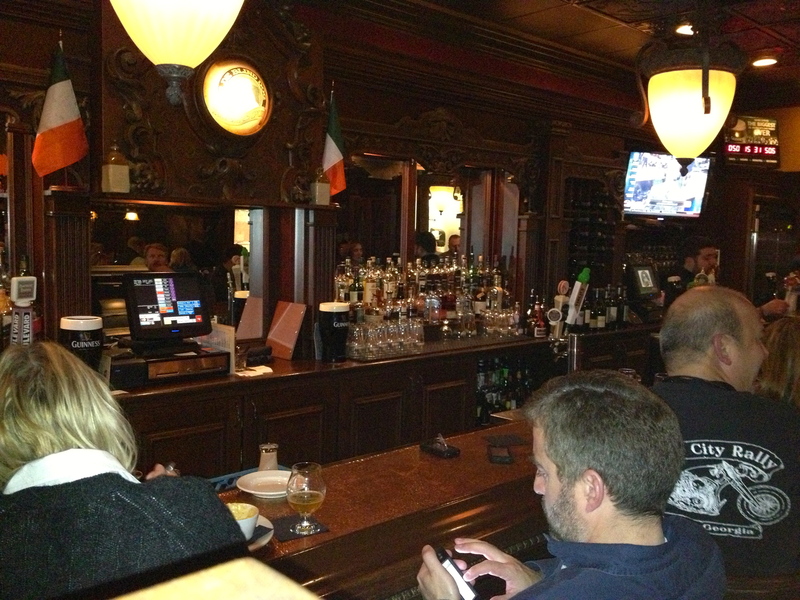 As you would expect from your local Irish pub, the decor features a lot of dark wood, glass, and beer signs. Just about everyone is drinking beer–our kind of crowd. We dive right into the menu to see what’s on tap. They have the usual Guinness-Harp-Smithwick’s beers that you would expect in an Irish pub. They also have a special craft beer section on tap that has some hard-to-find brews. 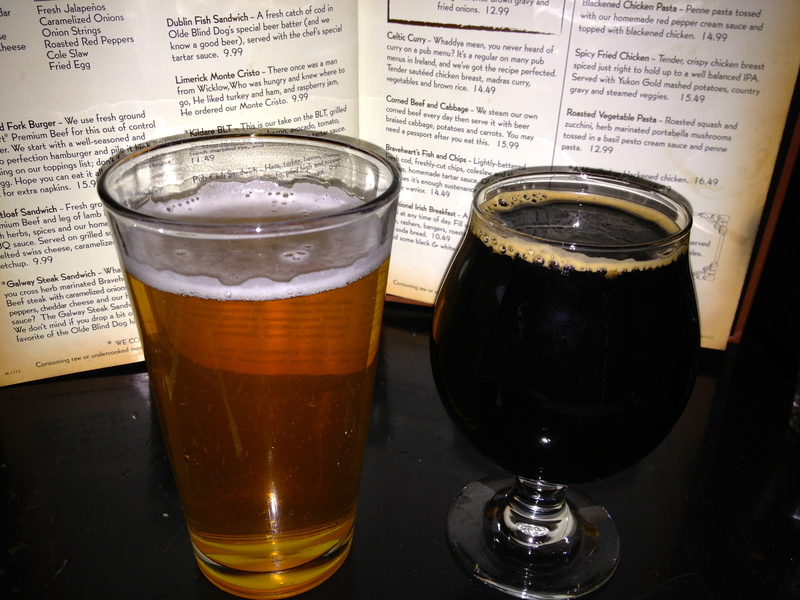 It’s a tough choice, but our waiter brings us three tastes to help us make up our mind. Eve goes bottled with the Victory Golden Monkey. It’s one of our favorite trippels and it’s amazing that they can make a Belgian beer this good in Pennsylvania. It’s 9.5% ABV, so it’s a good thing Eve is not driving tonight. Mine is from England and tastes like coffee at first, but then mellows out as it finishes. It’s a good beer to drink on this cold night. 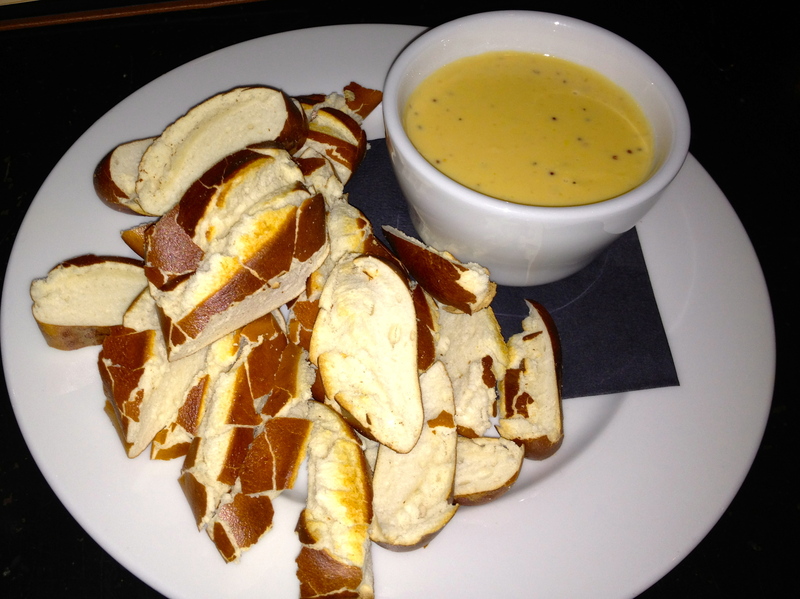 We are hungry, and when there is pretzel bread with cheese-ale dip on the menu, you can be certain that it will wind up on our table. This tastes as good as it looks, and we were looking for ways to lick the bowl of cheese once the pretzel bread was gone. This is the perfect pub appetizer. We are splitting an entree tonight, and everything looks good. We want something that says “Irish”, and try to choose between the shepherd’s pie, the bangers and mash, or this dish. 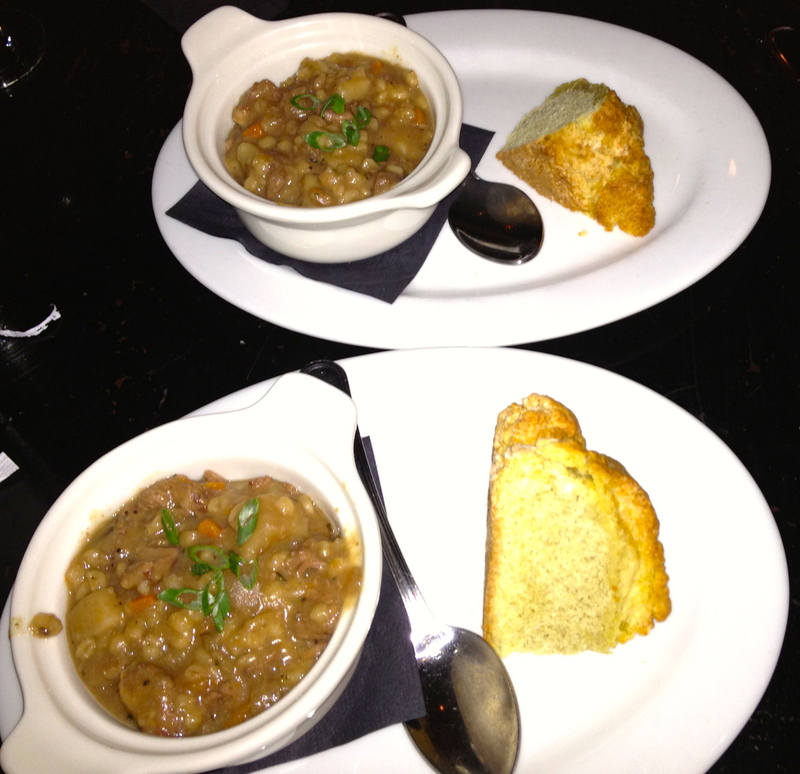 Irish stew, split in two. When in an Irish pub, why not have the Irish stew? They are nice enough to split it for us–how romantic. The stew is hearty and filling, which keeps us from getting stuffed. It comes with a dense soda bread, which is a little heavier than we are used to, but is very handy for dipping into the stew. Because we split dinner, we have room for dessert. 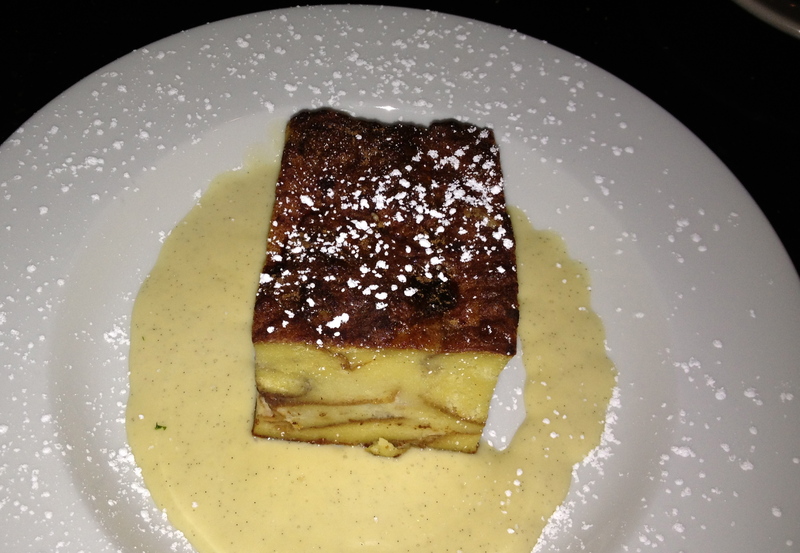 Bread pudding with creme anglais. I have a soft spot for bread pudding which I inherited from my father. This is a huge dessert, which four people could easily share. Not only does it have egg bread in it, but it also has raspberry danish, which gives it a sweet, fruity taste. The creme anglais pulls it altogether and is a welcome change from the last two bread puddings (Bone Lick BBQ and Muss and Turner’s) we had which did not have any sauce. So did the Blind Dog kitchen keep up with the Friday night crowds? We are pleased to report that it did. Our server, Joe, did a great job, and we had a very pleasant experience at our “Plan C”. We hope that Blind Dog can be this good the next time we stop in for lunch.